The concept in CMAC is to stay out of trouble whenever possible. The best form of self-defence is not to be there in the first place. 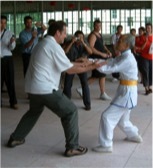 If that is not possible there is a Chinese dictum – “we beg and we plead not to fight and then we strike!” Although we also profess “karate ni sente nashi,” meaning “there is no first attack in karate,” O’Sensei Kim pointed out that it doesn’t mean you have to wait for the person to hit you. The fight started when they made their intent clear. 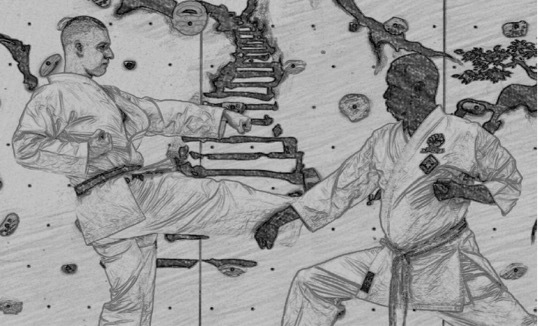 So our first strategy is to have the correct state of mind, “ai uchi,” meaning “we are ready to die if we must and to take the assailant with us.” The assailant should perceive that this encounter is going to be a battle of life and death and we trust that we will both choose life. Responding to the opponent's attack – a counter. The Japanese character for “sen” can also be read as “saki.” It means “before or ahead” but in the terms “go no sen,” “sen no sen” and “sen sen no sen,” it is an abbreviation of sorts for the word “sente,” meaning initiative or lead. The “te” in sente means hand, so sente directly translates as “beforehand.” In budo, sente refers to an attack or the initiative to attack. As O’Sensei Kim puts it – beat the opponent to the punch. Go no sen involves blocking any attack strongly and then launching a counter attack, also known as “osi waza.” In the case of a jodan oi zuki attack, the defender could shift back into zenkutsu dachi and execute a strong jodan age uke, and then deliver a gyaku zuki as a counter attack. A chudan oi zuki could be responded to by a chudan soto uke and a gyaku zuki. Again, after the counter, it is important to hold zanshin and then shift out of range and back into kamae. Sen no sen means “before the attack.” Sometimes this timing is also called “mae no sen,” mae also meaning “in front of.” Sen no sen implies that Semete is aware of Ukete’s intention of attacking and right at the time when Ukete is starting to attack, Semete steps in and stops the attack. One distinction between this and the following is that in this case Semete’s action follows Ukete’s physical movement. “When you don't just know when he's thinking, but can dissipate his Satsui or evil intent. Set up techniques, get him to move as you wish. Set him up for the foot sweep. Utilizing feigning techniques. - If you're hurt pretend you're not and vice versa. for a defensive technique. This is when you don't just know what and when they’re thinking, but how and when they are planning on doing it so that you can forestall their action and can dissipate their satsui (evil intent). In this case Semete’s action preceeds Ukete’s physical movement. As an extension to sen sen no sen, there is “kake waza.” This is charging without the opponent making an attack the instant that there is “kyo” (opening).